As I promised you last time, today I will talk about one of the central data structures that we’ll use throughout the rest of the series, so buckle up and let’s go. Up until now, we had our interpreter and parser code mixed together and the interpreter would evaluate an expression as soon as the parser recognized a certain language construct like addition, subtraction, multiplication, or division. Such interpreters are called syntax-directed interpreters. They usually make a single pass over the input and are suitable for basic language applications. In order to analyze more complex Pascal programming language constructs, we need to build an intermediate representation (IR). Our parser will be responsible for building an IR and our interpreter will use it to interpret the input represented as the IR. It turns out that a tree is a very suitable data structure for an IR. Let’s quickly talk about tree terminology. 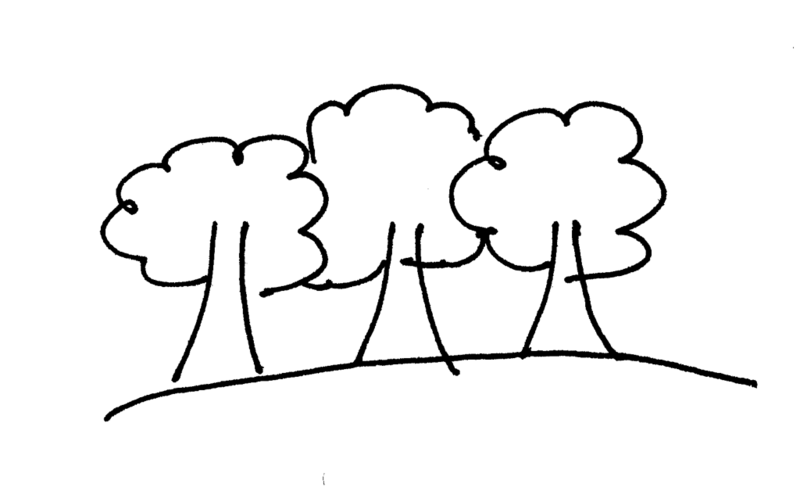 A tree is a data structure that consists of one or more nodes organized into a hierarchy. The tree has one root, which is the top node. All nodes except the root have a unique parent. 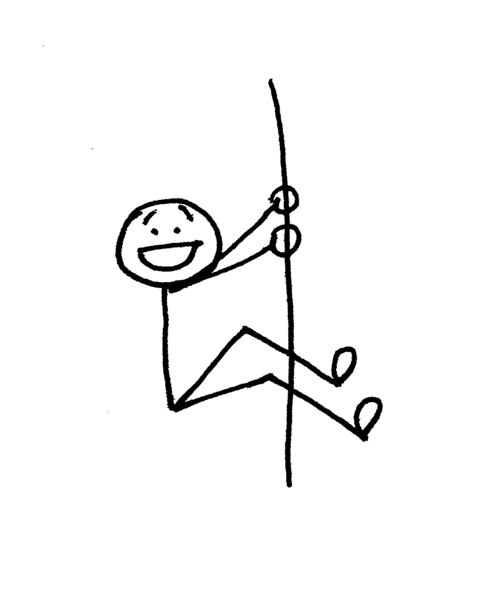 The node labeled * in the picture below is a parent. 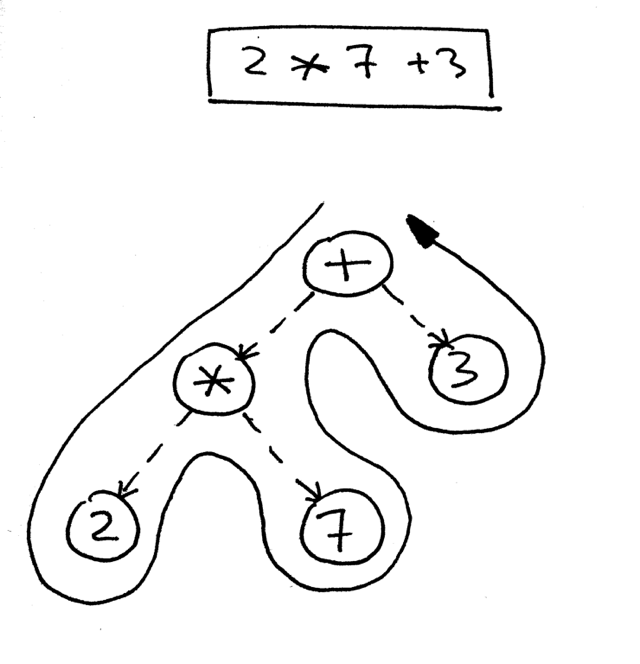 Nodes labeled 2 and 7 are its children; children are ordered from left to right. A node that has one or more children and that is not the root is called an interior node. The children can also be complete subtrees. In the picture below the left child (labeled *) of the + node is a complete subtree with its own children. 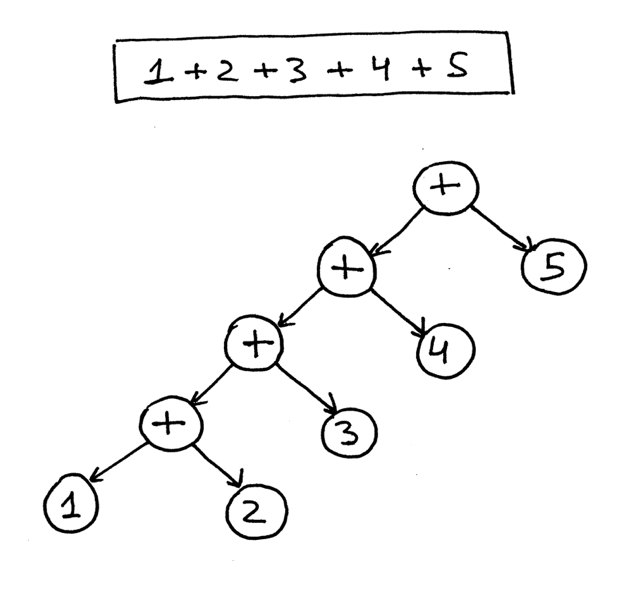 In computer science we draw trees upside down starting with the root node at the top and branches growing downward. The IR we’ll use throughout the series is called an abstract-syntax tree (AST). 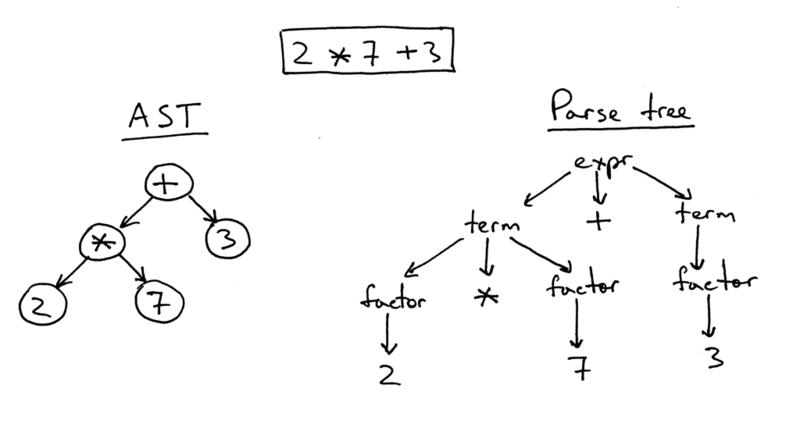 But before we dig deeper into ASTs let’s talk about parse trees briefly. Though we’re not going to use parse trees for our interpreter and compiler, they can help you understand how your parser interpreted the input by visualizing the execution trace of the parser. We’ll also compare them with ASTs to see why ASTs are better suited for intermediate representation than parse trees. 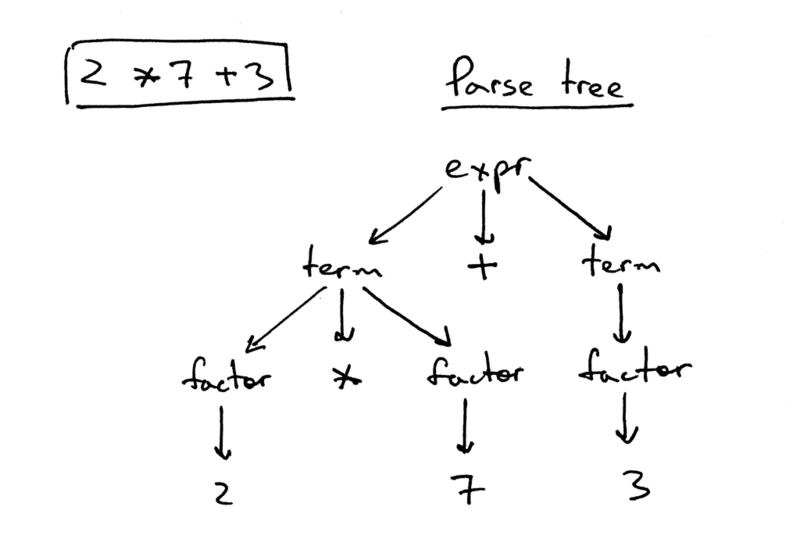 So, what is a parse tree? A parse-tree (sometimes called a concrete syntax tree) is a tree that represents the syntactic structure of a language construct according to our grammar definition. It basically shows how your parser recognized the language construct or, in other words, it shows how the start symbol of your grammar derives a certain string in the programming language. The call stack of the parser implicitly represents a parse tree and it’s automatically built in memory by your parser as it is trying to recognize a certain language construct. The parse tree records a sequence of rules the parser applies to recognize the input. The root of the parse tree is labeled with the grammar start symbol. Each interior node represents a non-terminal, that is it represents a grammar rule application, like expr, term, or factor in our case. Each leaf node represents a token. As I’ve already mentioned, we’re not going to manually construct parser trees and use them for our interpreter but parse trees can help you understand how the parser interpreted the input by visualizing the parser call sequence. Play with the utility a bit by passing it different arithmetic expressions and see what a parse tree looks like for a particular expression. Now, let’s talk about abstract-syntax trees (AST). This is the intermediate representation (IR) that we’ll heavily use throughout the rest of the series. It is one of the central data structures for our interpreter and future compiler projects. As you can see from the picture above, the AST captures the essence of the input while being smaller. ASTs uses operators/operations as root and interior nodes and it uses operands as their children. ASTs do not use interior nodes to represent a grammar rule, unlike the parse tree does. ASTs don’t represent every detail from the real syntax (that’s why they’re called abstract) - no rule nodes and no parentheses, for example. ASTs are dense compared to a parse tree for the same language construct. 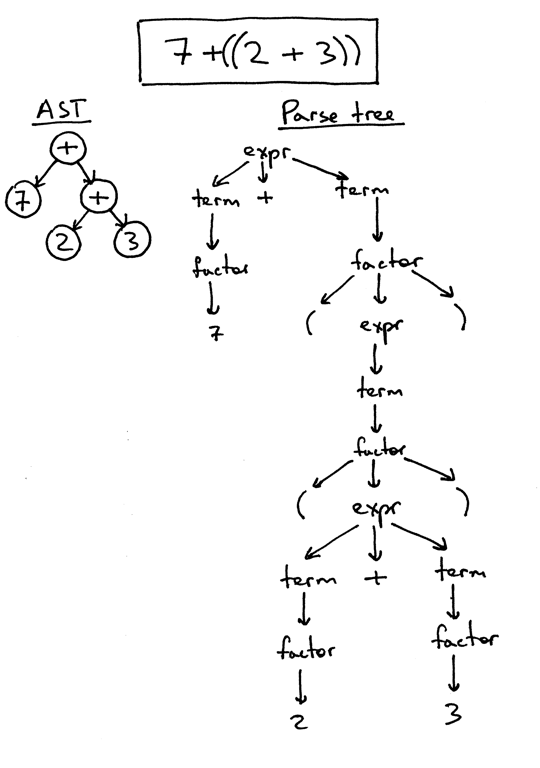 So, what is an abstract syntax tree? An abstract syntax tree (AST) is a tree that represents the abstract syntactic structure of a language construct where each interior node and the root node represents an operator, and the children of the node represent the operands of that operator. So far so good, but how do you encode operator precedence in an AST? In order to encode the operator precedence in AST, that is, to represent that “X happens before Y” you just need to put X lower in the tree than Y. And you’ve already seen that in the previous pictures. From the pictures above you can see that operators with higher precedence end up being lower in the tree. Okay, let’s write some code to implement different AST node types and modify our parser to generate an AST tree composed of those nodes. The parameters to the constructor are left, op, and right, where left and right point correspondingly to the node of the left operand and to the node of the right operand. Op holds a token for the operator itself: Token(PLUS, ‘+’) for the plus operator, Token(MINUS, ‘-‘) for the minus operator, and so on. As you’ve noticed, all nodes store the token used to create the node. This is mostly for convenience and it will come in handy in the future. 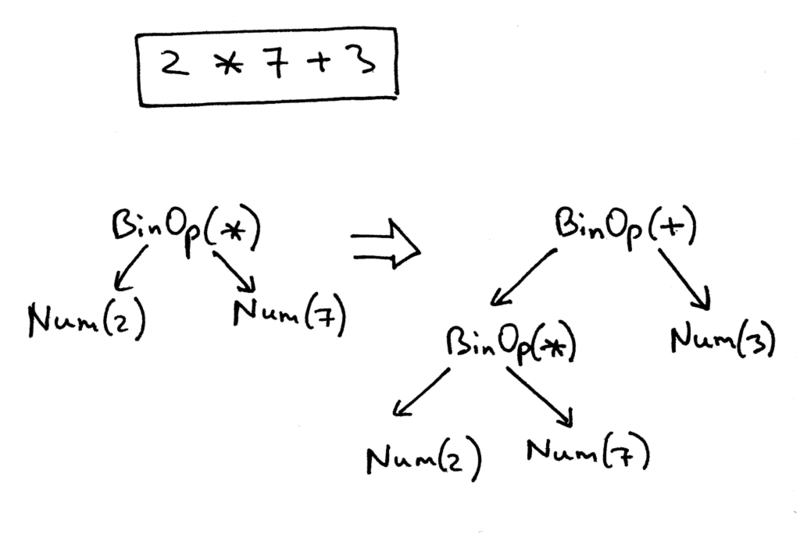 Let’s go over the process of an AST construction for some arithmetic expressions. It’s worth your while to write some arithmetic expressions, manually draw ASTs for the expressions, and then verify them by generating AST images for the same expressions with the genastdot.py tool. That will help you better understand how ASTs are constructed by the parser for different arithmetic expressions. 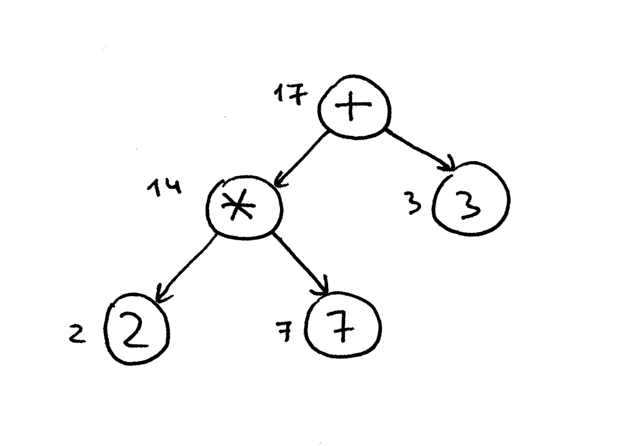 How do you navigate the tree to properly evaluate the expression represented by that tree? You do that by using a postorder traversal - a special case of depth-first traversal - which starts at the root node and recursively visits the children of each node from left to right. The postorder traversal visits nodes as far away from the root as fast as it can. Sometimes you might have to execute certain actions at all those points (preorder, inorder, and postorder). You’ll see some examples of that in the source code repository for this article. Okay, let’s write some code to visit and interpret the abstract syntax trees built by our parser, shall we? There are two interesting things about the code that are worth mentioning here: First, the visitor code that manipulates AST nodes is decoupled from the AST nodes themselves. You can see that none of the AST node classes (BinOp and Num) provide any code to manipulate the data stored in those nodes. 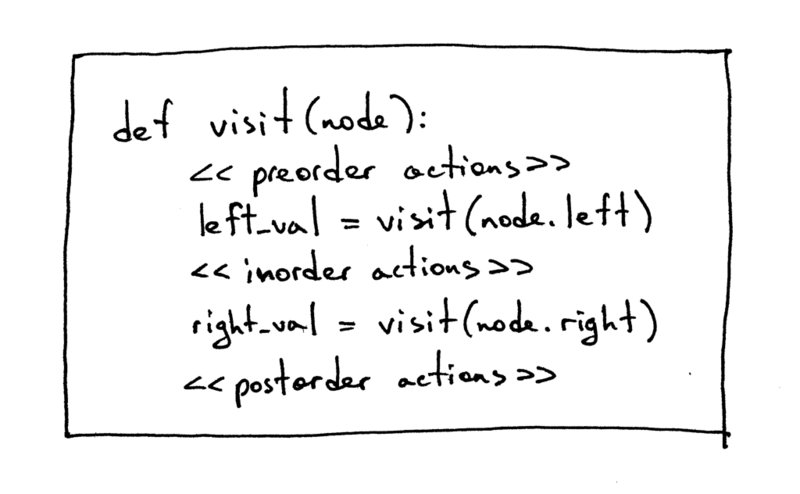 That logic is encapsulated in the Interpreter class that implements the NodeVisitor class. the NodeVisitor’s visit method is very generic and dispatches calls to the appropriate method based on the node type passed to it. As I’ve mentioned before, in order to make use of it, our interpreter inherits from the NodeVisitor class and implements necessary methods. So if the type of a node passed to the visit method is BinOp, then the visit method will dispatch the call to the visit_BinOp method, and if the type of a node is Num, then the visit method will dispatch the call to the visit_Num method, and so on. Spend some time studying this approach (standard Python module ast uses the same mechanism for node traversal) as we will be extending our interpreter with many new visit_NodeType methods in the future. The generic_visit method is a fallback that raises an exception to indicate that it encountered a node that the implementation class has no corresponding visit_NodeType method for. As you can see, I passed the root of the expression tree to the visit method and that triggered traversal of the tree by dispatching calls to the correct methods of the Interpreter class(visit_BinOp and visit_Num) and generating the result.
""" SPI - Simple Pascal Interpreter """
Save the above code into the spi.py file or download it directly from GitHub. Try it out and see for yourself that your new tree-based interpreter properly evaluates arithmetic expressions. That’s it for today, but before wrapping up I’d like to talk briefly about recursive-descent parsers, namely just give them a definition because I promised last time to talk about them in more detail. So here you go: a recursive-descent parser is a top-down parser that uses a set of recursive procedures to process the input. Top-down reflects the fact that the parser begins by constructing the top node of the parse tree and then gradually constructs lower nodes. Write a translator (hint: node visitor) that takes as input an arithmetic expression and prints it out in postfix notation, also known as Reverse Polish Notation (RPN). For example, if the input to the translator is the expression (5 + 3) * 12 / 3 than the output should be 5 3 + 12 * 3 /. See the answer here but try to solve it first on your own. Write a translator (node visitor) that takes as input an arithmetic expression and prints it out in LISP style notation, that is 2 + 3 would become (+ 2 3) and (2 + 3 * 5) would become (+ 2 (* 3 5)). You can find the answer here but again try to solve it first before looking at the provided solution. In the next article, we’ll add assignment and unary operators to our growing Pascal interpreter. Until then, have fun and see you soon. P.S. I’ve also provided a Rust implementation of the interpreter that you can find on GitHub. This is a way for me to learn Rust so keep in mind that the code might not be “idiomatic” yet. Comments and suggestions as to how to make the code better are always welcome.